Thanksgiving Day and every day many people from children to seniors would have very little to eat if it wasn’t for the support and care of our community. This week and next week there are numerous businesses, churches and organizations generously offering special turkey meals for free to those who may not otherwise be able to enjoy a turkey meal. 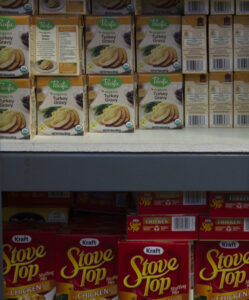 Two Thanksgiving classics, turkey gravy and stuffing, line the shelves at Iskam MǝkʰMǝk-Haws Food Pantry. A must have for a complete holiday dinner. volunteers will prepare and serve. Your support helps provide pantries and community meal sites with food they need to give food and prepare hot meals for their hungry neighbors. Thank you for being a community that cares. These meals will fill bellies with nutritious food and hearts with hope this holiday season. 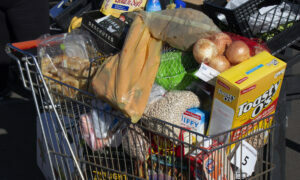 One family fills up a cart with everyday items they need plus all the favorites to prepare a Thanksgiving dinner. Thousands of families in our community will have a table full of food to share on Thanksgiving or the days before and to follow. In Grand Ronde, approximately 300 families were able to fill carts on Saturday, Nov. 17 in preparation for the holiday. Everyone in our community have enough to eat because of your generosity. We are #thankfull for all of you. Happy Thanksgiving! Volunteer, Erwin, hands out frozen turkeys to families who live in Grand Ronde and surrounding communities. “Feeding Our Neighbors” – Chill Grill Food Truck at the NorthBlock Food Carts is offering meals (an open faced turkey sandwich, a drink plus dessert) to 400 of our neighbors in need. 695 Liberty St. NE Salem on Wednesday 11/21 from 10AM – 3PM. Check out our get help page to find food resources near your home. Please call your local pantry or meal site to inquire about Thanksgiving meals or food not mentioned here.